Garnet Linden has an ordinary life on her family's Wisconsin farm, but when she finds a silver thimble at the start of the summer, she believes it might have some extraordinary magic in it. Indeed, not long after she finds the thimble, the drought which has plagued the farmers comes to an end, an orphan named Eric finds his way into the Linden family, and Garnet herself begins to experience adventures never before imagined. Though the 1930s bring about hard times that many would choose to forget, Garnet will always remember her thimble summer. 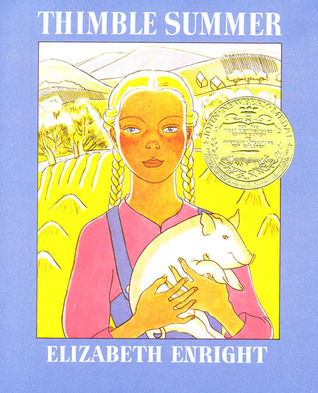 This lovely slice-of-life story, winner of the 1939 Newbery Medal, could make anyone nostalgic for an idyllic small-town summer whether they've ever actually experienced one or not. 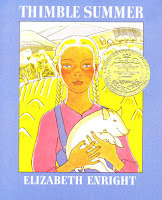 Garnet's adventures - getting locked in the library, hitchhiking to a neighboring city, attending the local fair - are not necessarily the most exciting things ever to happen in fiction, but they are enjoyable to read about because of the way Enright describes them. By giving Garnet such a stubbornly positive and hopeful disposition, she makes it impossible for the reader to dislike her, and she cultivates in the reader an unshakable desire to follow Garnet wherever she may lead. This love for Garnet as a character is furthered by the way the other characters in the story react to her. Citronella, who is a "wet blanket" type of character always worried about being careful and not getting into trouble, still chooses to spend time with Garnet. Mr. Freebody, the Lindens' neighbor, sticks his neck out again and again to make sure Garnet is happy and healthy. Even Jay, Garnet's brother, and Eric, the orphan who comes to work on the farm. seem to have a special feeling for Garnet, which only makes the reader more intrigued by her every move. Thimble Summer is a quiet book which is likely to appeal to more serious and introverted readers. Though there are vague hints early on that the thimble might have magical properties, this is a product of Garnet's imaginative thinking and not a truly fantastical element to the story. This is a realistic fiction novel through and through and will be loved especially by kids who like to read about the everyday occurrences in the lives of other kids.